By LUDWIG VON KOOPA - They have nothing to be proud of. Hey, remember Atari? Well, if you were too young to remember Manuel Noriega from yesterday, you're definitely too young to remember Atari. Well, in their present state, they're a washed up gaming company from forty years ago who had their own line of systems and games like Centipede, Asteroids, and E.T.. They caused that whole videogame crash thing in 1983. Well, for whatever reason, Atari is still around in some form. The way they got from then to now is a bit complicated, but they are still here. Now they're publishing mobile games and rereleasing those old properties. Well, shallow arcade experiences does seem to fit the whole shallow mobile gaming scene. According to Atari's press release, it's a gay pride parade simulator. Well... um... I guess that is an original idea, and not just by their standards, but by the industry as a whole. Although, I will say, just because an idea is original doesn't mean it's... good. Let's read on more about this idea, though. "Pridefest™ [is] an original social-sim game for tablets and mobile devices. Pridefest™ empowers players to create and launch their very own personalized pride parade in a city of their choosing [...] with the goal of keeping their city happy and vibrant." Well, it's a definition of inclusive I don't subscribe to, that's for sure. But I'm not an Atari fan and I never was. So maybe for whoever the hell on Earth IS an Atari fan, it would be inclusive. In that case, Atari must know however small their audience is really well, and that's admirable for any company. 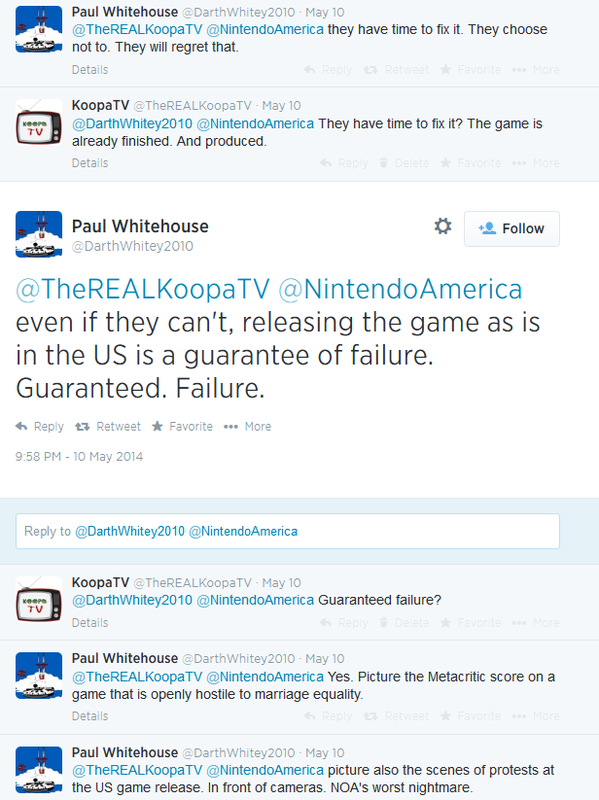 We value customer service at KoopaTV! "Atari recently sponsored and attended the second-ever GaymerX convention where LGBT gamers and allies united in celebration of equality and diversity in gaming." Meanwhile at the same time, Nintendo was sponsoring EVO 2014. You take your pick on what was better. And now we have an amusing quote from a "Matt Conn" guy, who made that convention. Right, large publishers. For all of the "progress" that gay people tend to cite, and how we're in the "21st Century" so we should all be radically different than the good ol' days, it's pretty astonishing that this Matt Conn guy is so intellectually dishonest so Atari can use him to promote their PR. At most recent head-count, Atari has a whopping ten employees. And was just in bankruptcy proceedings. (You know, now, not like twenty years ago when you think that would happen.) They were a "large publisher" maybe 30 years ago. Now? People don't even know they are still in business. Supporting the gay community is a difficult thing. I mean, just look at the complaints you get! You got the rainbow flag wrong! OUTRAGE! It's those kinds of things that companies have to hire specialized consultants for, and those guys charge hundreds of thousands of dollars for their exploitative services. But pandering to this niche market is Atari's core competency now — along with online casinos, social gambling, and... YouTube...? So I guess it's a justified investment. Meanwhile, Nintendo is supposed to be bankrupt over the sales failure of Tomodachi Life. Wait, what's that? Tomodachi Life surpassed sales expectations in the USA? And it was the 9th best-selling game in the USA during June 2014? But... but... GUARANTEED FAILURE. "the game will be sensitive to the LGBT community, and the company is consulting with the organizers of pride festivals." We sent KoopaTV's roaming reporter to interview with these pride festival leaders in San Francisco. After we did that, we... have completely lost touch with him. We fear the worst: Death by Rosie O'Donnell. In conclusion, if you're an Atari employee or an Atari fan in 2014, you have nothing to be proud of. That kind of pride is just dangerous in this day and age. By the way, I once wrote an academic-style essay about Eli Porter (the dude in the video above). It included a lot of things about the treatment of gay issues in the black community. Read it if you want. Ludwig has pride with what he has done with KoopaTV, however. That is something that is just fine with having pride in. You should have pride in it too, and stay tuned to KoopaTV's posts every weekday! For more information on bad companies pandering to the gay community for reputation, look here! Ludwig's Facebook account got banned, so you can't read the academic-style essay. Atari ain't the only casino guys around.